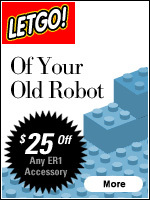 I was checking out Evolution Robotics website, and I noticed a special deal where anyone can get $25 dollars off an ER1 kit if they "Let Go" of their Lego Mindstorms Kit. 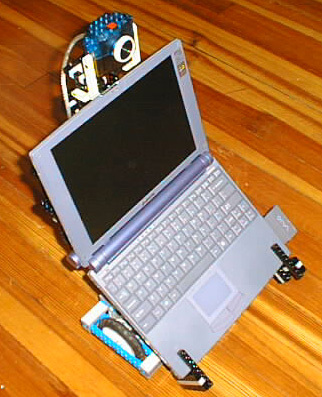 Due to my prior history with Lego Mindstorms, in particular BattleBricks, I knew that a Lego Mindstorms Kit would have no problem driving around a laptop. So began my robotic creations. 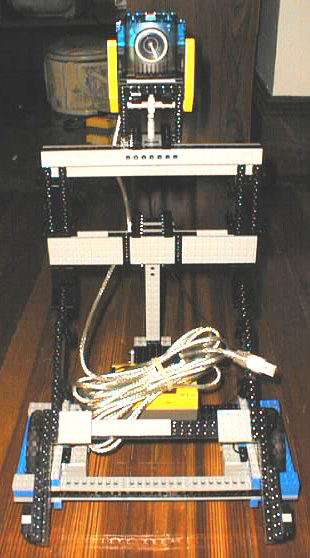 The plan will be to implement most of the functionality of the ER1 system with Legos. Can it be done? I have named my first prototype Robotics Creation #1, or RC1. Some claim that I don't come up with very original names for my robots, and this is evidence of that. The concept is simple, but requires a decent amount of beams and plates. I'm using a total of 5 motors: 2 per wheel, and 1 motor to adjust the camera angle. 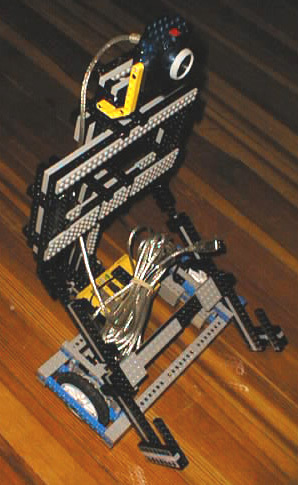 The camera is from the Lego Mindstorms Vision Command Set. I've designed RC1 to fit my Sony VIAO, which weights a little over 3 lbs. Below are some pictures of the core platform. I will soon post MLCad instructions, and then start working on the software. I will probably end up using LeJOS, due to its implementation of the Vision Command software. 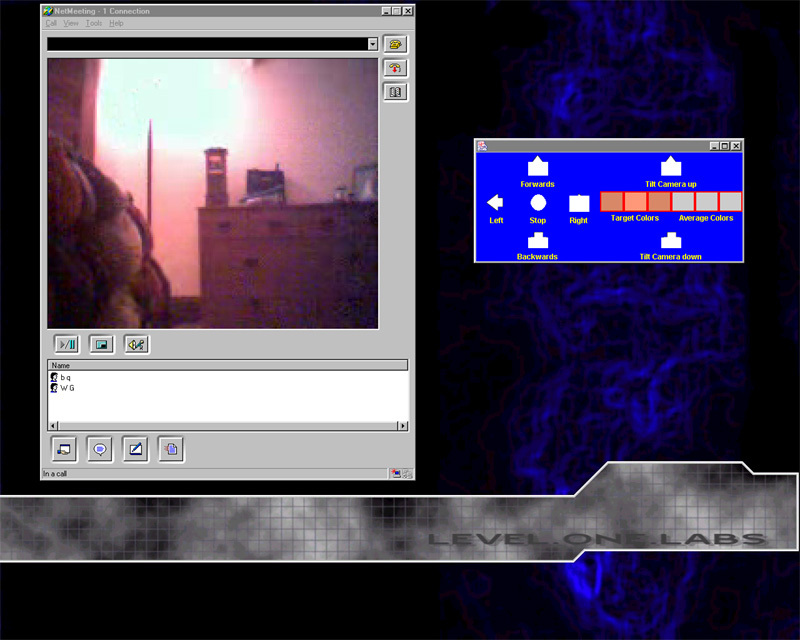 I took a first attempt at getting RC1 moving around and acting as a telepresence robot. I used NetMeeting and LeJOS almost out of the box to get RC1 into another room. I'll probably end up using the Java Media Framework for everything, but I wanted to at least get something going quickly. I installed LeJOS onto my laptop, got the firmware uploaded to the RCX, and wrestled with the Vision Command software for a little bit. Finally, I got the basic Vision Remote Control example working. I then made a modification to the example code that allows the control application to run it as a client and server, which allows for remote driving of the RC1 from another PC (The Laptop driving RC1 has a WLAN PCMCIA Card). Check out the modified code here. This code was thrown together in a matter of minutes, so please forgive me if there are some bugs. I tested the robot by driving it into another room and maneuvering around a little bit. RC1 with the Remote Control program was a little to fast on its turns, and tended to move to the left a little. 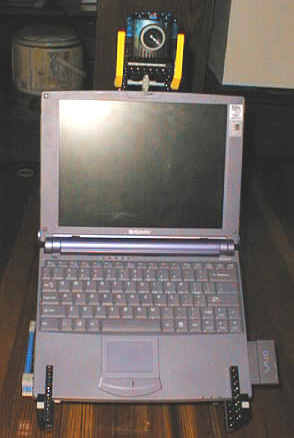 On the right is a screenshot of my desktop computer with NetMeeting and the control panel for RC1. 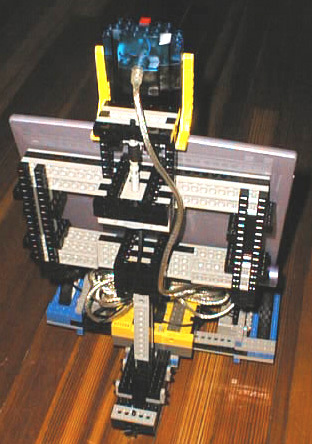 This site is in no way affiliated with Evolution Robotics, inc. or The Lego Group.